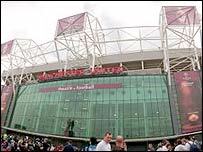 The RFL and Manchester United have reached a deal to stage rugby league's Grand Final at Old Trafford for the next four seasons. The attendance has grown every season culminating in this year's sell out. "The Grand Final has become one of British sport's major occasions and Old Trafford has been a key component," said RFL chief executive Richard Lewis. "It's a unique event which an increasing number of supporters wish to be a part of." He added: "The stadium enjoys a global reputation as a world class sporting venue and we believe that makes it an appropriate place to stage our Super League title decider. Manchester United chief executive David Gill said: "It is always a pleasure to host the Grand Final." "We are delighted that we will be welcoming the RFL for a further four years."